He has written several articles on painting for the Artists Magazine, is called upon to jury shows, and is a popular and enthusiastic workshop teacher around the country and abroad. 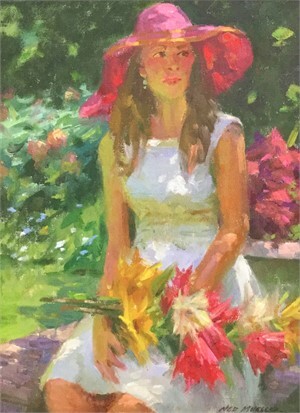 He is a signature member of The Plein Air Painters of America, Portrait Society of America, The California Art Club, The Northwest Watercolor Society, Northwest Pastel Society (Distinguished Pastelist), Northwest Rendezous Society, Laguna Plein Air Painters , Puget Sound Group of Northwest Painters and the American Society of Marine Artists. He is the only Northwest Artist that is designated a Master Signature Artist by the Oil Painters of America and The American Impressionist Society. He exhibits his work in some of the finest shows and galleries in the country and has won numerous awards. He has been invited to participate in the Great American Artist Show, Artists of America Show, Plein Air Painters of America, Oil Painters of America, National Academy of Western Art, Knickerbocker Show, The Northwest Rendezvous Group, The California Art Club, The Salmagundi Club, Puget Sound Group of Northwest Artists, Pastel Society of America, American Society of Marine Artists and the Autry Western Masters Show. He continues to challenge and improve his work on location and in the studio. Ned Mueller Born in Wisconsin and raised in Montana, Ned Mueller has been drawing and painting all of his life. He graduated from the prestigious Art Center School of Design in Los Angeles where he also taught drawing while still a student. His love for life and art is reflected in his superb paintings of a wide range of subjects including Portraits, Figures, Animals and Landscapes, both studio and plein air. Ned worked as an illustrator for 25 years while building a solid foundation of professionalism and has worked as a successful full time artist since 1984. He continued to enhance his knowledge and skills by taking workshops with master artists Harley Brown, Richard Schmid, Bettina Steinke, Del Gish, and Sergei Bongart. He has written several articles on painting for the Artists Magazine, is called upon to jury shows, and is a popular and enthusiastic workshop teacher around the country and abroad. He is a signature member of The Plein Air Painters of America, Portrait Society of America, The California Art Club, The Northwest Watercolor Society, Northwest Pastel Society (Distinguished Pastelist), Northwest Rendezous Society, Laguna Plein Air Painters , Puget Sound Group of Northwest Painters and the American Society of Marine Artists. He is the only Northwest Artist that is designated a Master Signature Artist by the Oil Painters of America and The American Impressionist Society. He exhibits his work in some of the finest shows and galleries in the country and has won numerous awards. He has been invited to participate in the Great American Artist Show, Artists of America Show, Plein Air Painters of America, Oil Painters of America, National Academy of Western Art, Knickerbocker Show, The Northwest Rendezvous Group, The California Art Club, The Salmagundi Club, Puget Sound Group of Northwest Artists, Pastel Society of America, American Society of Marine Artists and the Autry Western Masters Show. He continues to challenge and improve his work on location and in the studio.